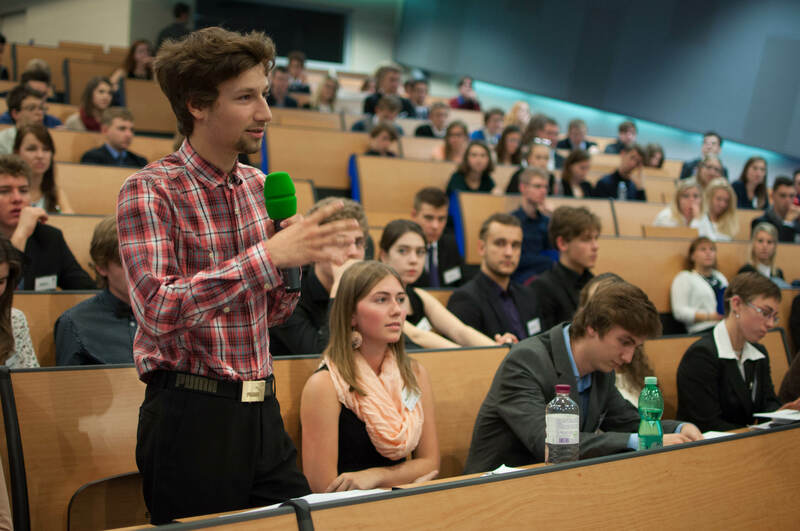 The Prague Student Summit consists of three models: two for high school students (Model UN, Model NATO) and one for university students (Model EU). In some cases high school and university students interact in chosen Model UN bodies where older students represent interests of several different advisory bodies or international organizations, such as the World Bank Group. On the XXIII season, there will also take place spring simulation of the Model OSCE and summer international Model V4+. During the autumn, there will be a series of regional simulations in various towns across the Czech Republic (more information about them can be found on the Czech website). Model UN is the largest one in Prague Student Summit. It offers an opportunity to represent a UN member state in one of the simulated bodies to high school students who can choose the body according to the agenda they are interested in the most. Model NATO is designed for twenty-nine high school students who are selected to sit in the North Atlantic Council. The language of negotiations is exclusively English. The model is therefore recommended to those students who are interested not only in the security issues but also in the possibility to improve their foreign language skills. Are you ready to negotiate about key issues, which are necessary to keep peace and, at the same time, to make compromises that are necessary to reach the unanimity? Then the Model NATO is exactly the right one for you. Model EU simulates the Council of the European Union and deals with the topical issues, which are currently discussed in the real European Union. The Model is designed for university students and the language of negotiations is Czech.